Calling it one of the deadliest train accidents in the last 17 years, which led to critical injury to over 200 people, the Indian Stainless Steel Development Association (ISSDA), the apex body representing the stainless steel industry, said. 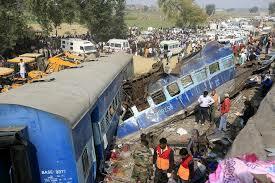 “In the light of the accident, the conversion of coaches needs to be fast tracked by the railways before any more many innocents lose their lives”, it added. “Developed countries like USA, Canada, Brazil, Japan, Korea and Australia and many East Asian countries use stainless steel for passenger coaches”, ISSDA, which represents about 145 players in the stainless steel industry, said. The ISSDA statement follows Indian Railways announcing replacement of all old steel coaches by stainless steel in a phased manner. Production of stainless steel in 2015 was 190 times higher than in 1978, 15 times higher than in 1990 and more than 3 times higher than in 2000, reaching 3.5 million tonnes in 2015. On an average India had an annual growth rate of 16% since 1978. The production of stainless steel stagnated in 2014, but recovered in 2015. Currently, the dominant demand of stainless steel comes from the utensils and kitchenware application segment (65 per cent), while the industrial applications constitute about 35 per cent of the overall demand. The local product range capability is rather limited, so imports are vital for high end advanced materials requirements of end users. Claimed ISSDA, stainless steel coaches are stronger and absorb more energy during collision as compared to carbon steel. They also have the ability to withstand considerable impact without fracturing. Since it progressively crumples from the point of impact, risk of injury and fatalities are drastically reduced. Quoting the Anil Kakodkar High-Level Safety Review Committee, ISSDA said, it has mandated “a complete switchover” to stainless steel coaches within five years. “We expect railways to act now on immediate basis and switch to stainless steel coaches for making rail journey safer and prevent any further loss of lives due to accidents”, stressed K.K Pahuja, President ISSDA. Currently, Indian Railways use stainless steel coaches for Rajdhani, Shatabdi and other premium trains. These coaches are designed to be anti-telescopic, which means they do not pile up over each other in the event of derailment thereby reducing casualties. Stainless steel coaches, said industry sources, entail a weight reduction of about 2.5 tonnes. An empty chair car weighs 43 tonnes, while a loaded one is 47 tonnes. “Approximately 22 million people, every day commute through trains in India. Hence, there is an urgent need to replace existing coaches with stainless steel coaches to ensure better safety for the passengers”, the statement said.